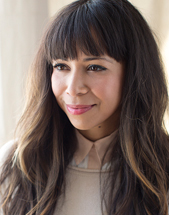 It isn’t officially summer yet and oddly enough, Los Angeles is feeling a lot like autumn? It’s cool and crisp and I’ve been wearing a hoodie everyday this week. But I know the heat is coming. And I want us all to be prepared. This drink is something that I would even drink without tequila or mezcal. It’s a delicious, refreshing drink that is tasty even without the alcohol. The agave was added only because we’re sort of at the beginning of watermelon season and my watermelon wasn’t as sweet as I would’ve loved it to be. But if you make this in say, July, you most likely won’t need it. The watermelon is cubed and then frozen. Think of it like watermelon ice cubes. 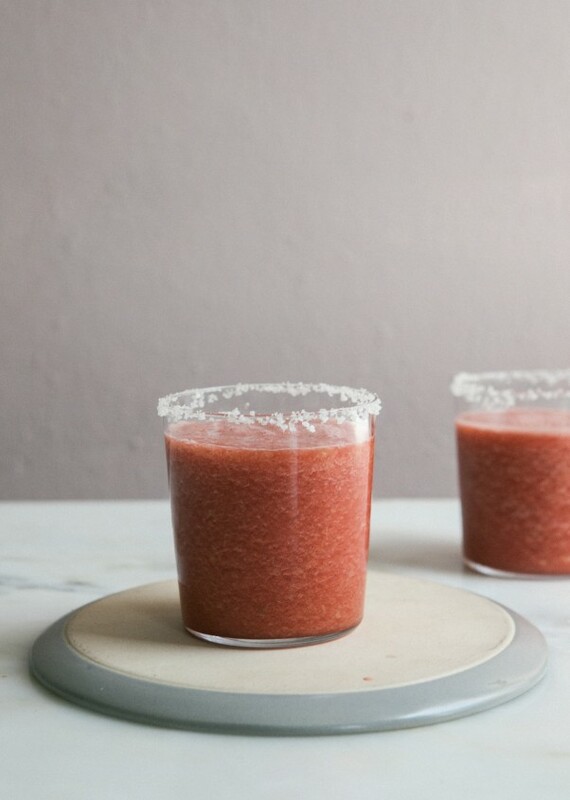 This makes it very watermelon-y without having to add any ice. The cucumber and lime add some additional refreshing flavor. And the tequila, well, it does a good job at making this extra enjoyable. Line a baking sheet with a sheet of plastic wrap (the watermelon will stick to parchment!). 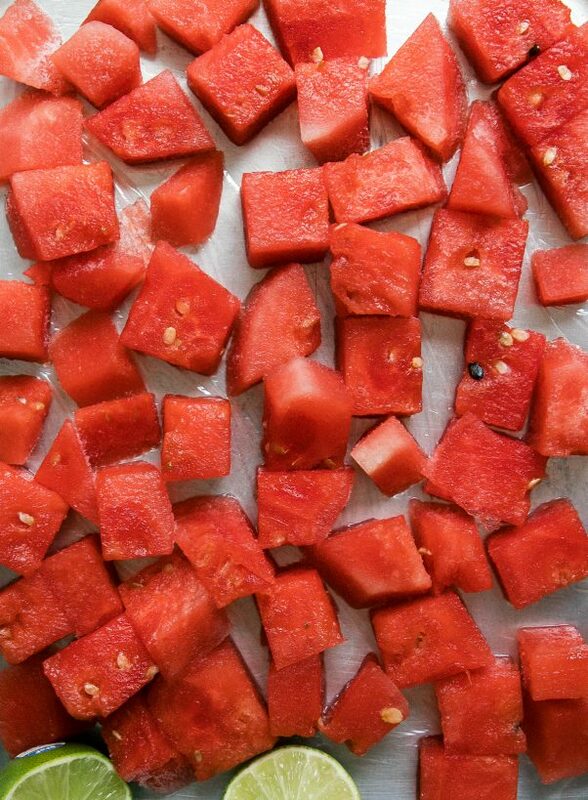 Transfer the cubed watermelon to the baking sheet. Stick it in the freezer to chill for about 45 minutes to 1 hour. 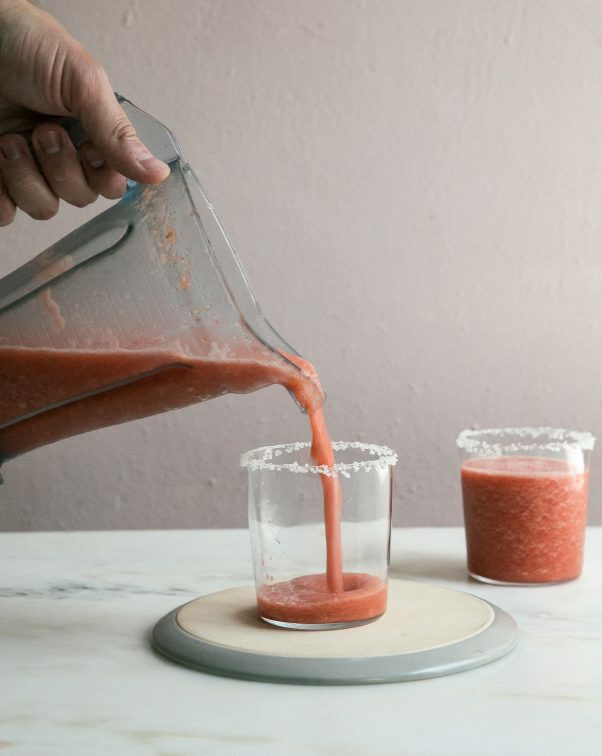 After the watermelon is pretty much frozen, add the watermelon to a blender, along with the cucumber, lime juice, tequila and agave nectar. Blend until turn into a slushy texture. Give it a taste and add more agave nectar to your liking. This will actually depend on how sweet your watermelon is. Mine was totally happy with 1 teaspoon of agave nectar. Rim the glasses with a bit of salt. 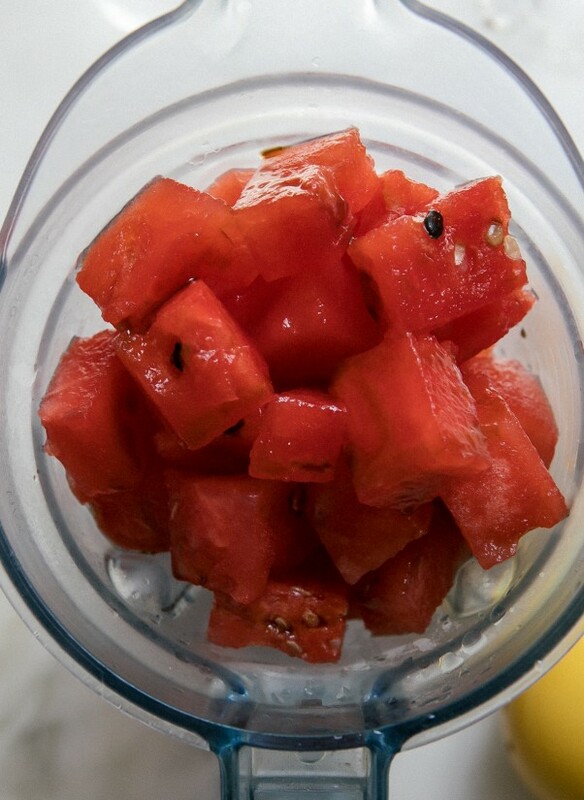 Or you can garnish with some watermelon slices. Divide amongst two glasses.